The motet Ascendens Christus first came out in 1572, and the Mass upon it was published in 1592. All the motet’s material is imaginatively absorbed into the composition of the Mass. The five voices are retained but sections for reduced choir (or soloists) are scored for four voices in varied combinations. The ‘Christe eleison’ is SSAT. The ‘Domine Deus’ in the Gloria is for SSAB. The Credo has the ‘Crucifixus’ and ‘Et resurrexit’ for SSAT. The Benedictus is for SATB. The Agnus Dei is set only once and is for six voices, SSATTB, in which the first tenors, altos and second trebles are in canon (trinitas in unitate). 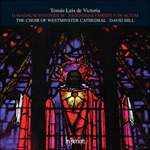 In this recording the Agnus Dei is sung twice, once to ‘miserere nobis’ and repeated to ‘dona nobis pacem’. All is lightness and brightness; the Gloria seems to bounce along, so springy are the rhythms, so concise and clearly declamatory with the verbal accents incomparably set. The triple-time Hosanna, sung to the same music after Sanctus and Benedictus, is typical of Victoria’s mature Masses. All is brief, clear and lightly decorated, perfect in liturgical propriety. Victoria regarded the Mass as something happy and often jubilant. There are moments of quiet adoration or contemplation, but it is very significant that Victoria never chose to base a Mass upon sad or penitential motets, but always upon those of a joyful nature.